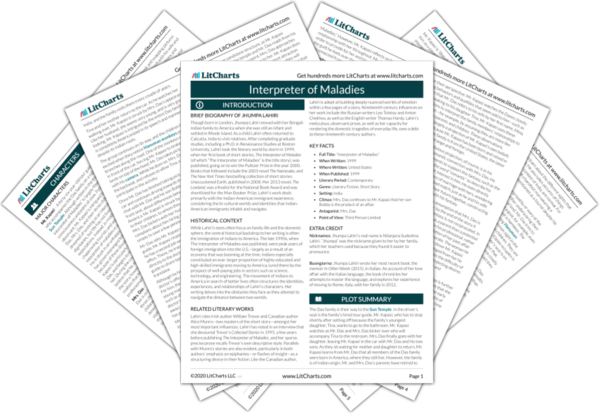 Instant downloads of all 946 LitChart PDFs (including Interpreter of Maladies). Welcome to the LitCharts study guide on Jhumpa Lahiri's Interpreter of Maladies. Created by the original team behind SparkNotes, LitCharts are the world's best literature guides. A concise biography of Jhumpa Lahiri plus historical and literary context for Interpreter of Maladies. A quick-reference summary: Interpreter of Maladies on a single page. In-depth summary and analysis of every of Interpreter of Maladies. Visual theme-tracking, too. Explanations, analysis, and visualizations of Interpreter of Maladies's themes. Interpreter of Maladies's important quotes, sortable by theme, character, or . 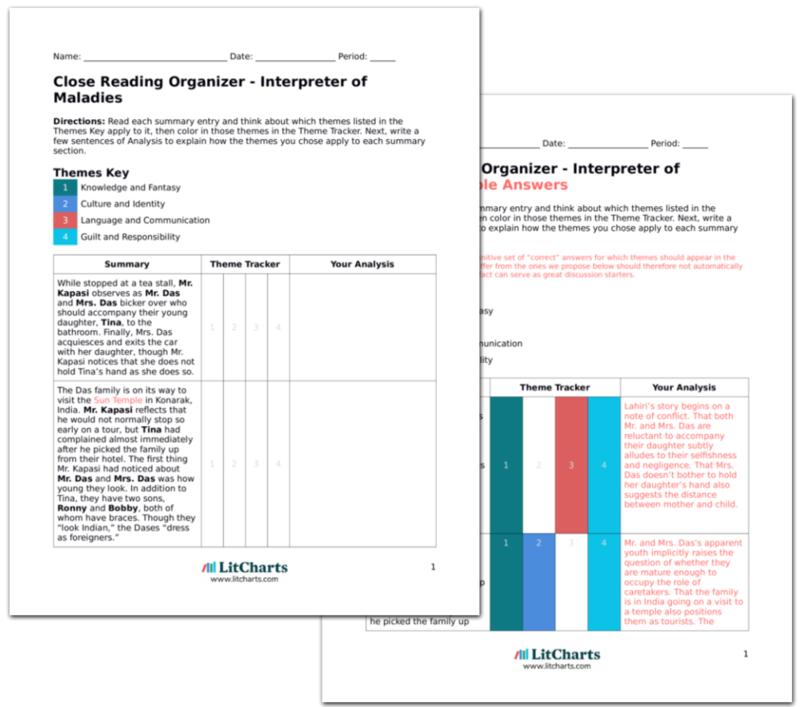 Description, analysis, and timelines for Interpreter of Maladies's characters. Explanations of Interpreter of Maladies's symbols, and tracking of where they appear. An interactive data visualization of Interpreter of Maladies's plot and themes. Though born in London, Jhumpa Lahiri moved with her Bengali-Indian family to America when she was still an infant and settled in Rhode Island. As a child Lahiri often returned to Calcutta, India to visit relatives. After completing graduate studies, including a Ph.D. in Renaissance Studies at Boston University, Lahiri took the literary world by storm in 1999, when her first book of short stories, The Interpreter of Maladies (of which “The Interpreter of Maladies” is the title story), was published, going on to win the Pulitzer Prize in the year 2000. Books that followed include the 2003 novel The Namesake, and The New York Times-bestselling collection of short stories Unaccustomed Earth, published in 2008. Her 2013 novel, The Lowland, was a finalist for the National Book Award and was shortlisted for the Man Booker Prize. Lahiri’s work deals primarily with the Indian-American immigrant experience, considering the bi-cultural worlds and identities that Indian-American immigrants inhabit and navigate. 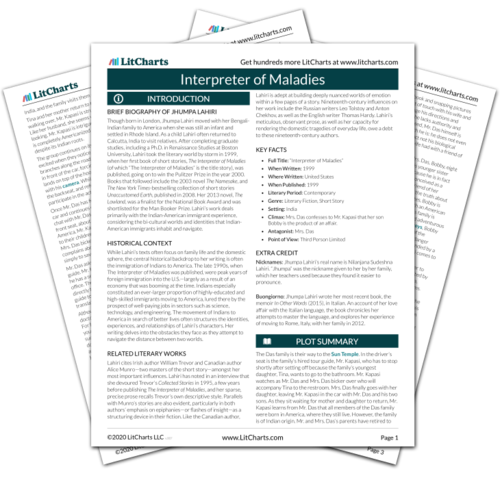 Get the entire Interpreter of Maladies LitChart as a printable PDF. While Lahiri’s texts often focus on family life and the domestic sphere, the central historical backdrop to her writing is often the immigration of Indians to America. The late 1990s, when The Interpreter of Maladies was published, were peak years of foreign immigration into the U.S.—largely as a result of an economy that was booming at the time. Indians especially constituted an ever-larger proportion of highly-educated and high-skilled immigrants moving to America, lured there by the prospect of well-paying jobs in sectors such as science, technology, and engineering. The movement of Indians to America in search of better lives often structures the identities, experiences, and relationships of Lahiri’s characters. Her writing delves into the obstacles they face as they attempt to navigate the distance between two worlds. Lahiri cites Irish author William Trevor and Canadian author Alice Munro—two masters of the short story—amongst her most important influences. Lahiri has noted in an interview that she devoured Trevor’s Collected Stories in 1995, a few years before publishing The Interpreter of Maladies, and her sparse, precise prose recalls Trevor’s own descriptive style. Parallels with Munro’s stories are also evident, particularly in both authors’ emphasis on epiphanies—or flashes of insight—as a structuring device in their fiction. Like the Canadian author, Lahiri is adept at building deeply nuanced worlds of emotion within a few pages of a story. Nineteenth-century influences on her work include the Russian writers Leo Tolstoy and Anton Chekhov, as well as the English writer Thomas Hardy. Lahiri’s meticulous, observant prose, as well as her capacity for rendering the domestic tragedies of everyday life, owe a debt to these nineteenth-century authors. Climax: Mrs. Das confesses to Mr. Kapasi that her son Bobby is the product of an affair. Nicknames: Jhumpa Lahiri’s real name is Nilanjana Sudeshna Lahiri. “Jhumpa” was the nickname given to her by her family, which her teachers used because they found it easier to pronounce. Buongiorno: Jhumpa Lahiri wrote her most recent book, the memoir In Other Words (2015), in Italian. An account of her love affair with the Italian language, the book chronicles her attempts to master the language, and explores her experience of moving to Rome, Italy, with her family in 2012. Abbas, Fatin. "Interpreter of Maladies." LitCharts. LitCharts LLC, 25 Sep 2018. Web. 11 Dec 2018. Abbas, Fatin. "Interpreter of Maladies." LitCharts LLC, September 25, 2018. Retrieved December 11, 2018. https://www.litcharts.com/lit/interpreter-of-maladies.